Barnsbury Primary School is situated in Woking, Surrey. 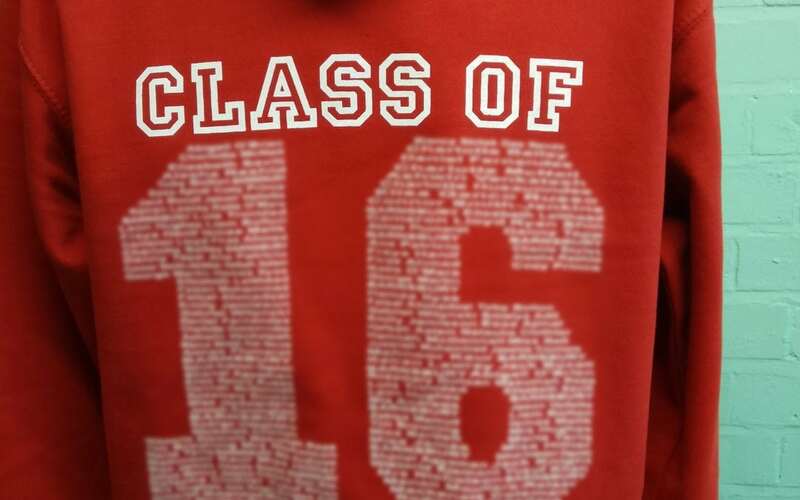 Here, we have created leavers hoodies for their leavers class of 2016, in its school colour of red. Barnsbury Primary School chose for their hoodies to have a ‘class of 16’ print, alongside custom names included in the main graphic. This is a great way of including the names of everyone in Barnsley Primary School’s leavers class on a hoodie, in a permanent way. This is a popular design with schools all over the UK, due to its high level of personalisation and standout design. At Leavers Hoodies Company, we can create this type of hoodie in many different colours and styles, using different types of print and other methods of personalisation, such as embroidery. For more information about this type of custom printed names leavers hoodie, or other types of leavers hoodies, contact us via email at [email protected] or call 01858 461 686.